What is a line producer? What do they do? Great question. And not uncommon, even for people well-versed in film. The role of the line producer, like many inner-workings of the entertainment industry, is shrouded in secrecy. We’ve got the “ins,” we’ve done the research, and right now we’re going to give you the ultimate answer to the question, “What does a line producer do?” We’ll also discuss line producer salary, how to become a line producer and everything you’ll need to get the job done. Everything you need to know about line producers. How Do You Become a Line Producer? 1.1 WHAT IS A LINE PRODUCER? A line producer is an essential managerial position. He or she is directly responsible for the financial aspects of a production. The line producer generates and continuously reviews the budget line-by-line (hence the job title). The line producer also oversees all operations and logistics for a film, from the pre-production phase through delivery of the completed work. A line producer’s role is often coupled with the title production manager or production supervisor, depending on the format or budget of the project. 1.2 HOW DO YOU BECOME A LINE PRODUCER? There’s no single way to become a line producer. While most start as office PAs and work their way up to production coordinators, others take different paths. Regardless of how you get there, stay dedicated and do each job to the best of your ability. People notice hard workers. And hard work is exactly what it takes to be a line producer. Stay engaged. Be alert, curious, and professional. 1.3 WHAT DOES A LINE PRODUCER DO? One of the best-kept secrets in Hollywood is the line producer salary. Truth is, it depends on the budget of your project and the experience of the line producer. A $70 million studio film might offer a talented line producer $6,500 per week. And that doesn’t include housing, meals, and per diem. A per diem in film is a stipend given to any employee, crew, or cast member traveling for a production. Per diems are mandated by entertainment industry unions for any production outside the 30 Mile Studio Zone (TMZ). Line producers working on commercials typically make between $450 and $900 a day. Of course, this is often higher if you have an impressive line producer resume. For a smaller film, say $7 million, a line producer can expect to make roughly one percent of the total budget. A line producer’s salary is often negotiated as a flat rate with several perks, such as production vehicles, kit fees, housing stipends, and more. The key to being a great line producer is simple: stay organized and efficient. Pay attention. Don’t wait for others to come to you. Meet with someone from every department every day. You need to be able to find anything, anywhere, in less than 30 seconds. Many believe the shoot they’ve so painstakingly planned will go off without a hitch. Line producers and assistant line producers know it’s not if something will go wrong, but when. Putting out fires is a major part of the line producer job description. Imagine doing everything without the right tools. Imagine trying to put out fires without a fire extinguisher. You’d burn up in a hodgepodge of PDFs and spreadsheets. Too much stress. A disaster waiting to happen. Production management software is your answer. Investing in a cloud-based production management solution will make it easy to stay on top of the many facets of production. StudioBinder is the most intuitive all-in-one workflow solution for film, television, and digital production. You can schedule the entire production and divvy up tasks. You can integrate all your contacts. You can build, distribute, and log your call sheets, and much more, all in one seamless resource. It’s the line producer’s job to make sure a little glitch won’t cause a chain reaction and grind production to a halt. This one question could save your production. So could keeping your schedule and documents in one easy-to-access place. The most common small fire you will encounter during your shoot is the meal penalty. Going over union-approved hours before a required meal break can cost more than just money. Morale is many times as important as the money involved. If necessary, a third meal should be ready to eat as soon as the crew realizes they’re working late. Keep your grips happy and save your production. Screen Actors Guild meal penalty guidelines differ from IATSE regulations, so be sure to do your research. By organizing your shoot correctly, you can synchronize meals without causing headaches. According to SAG-AFTRA, all performers must be given the first meal break within six hours of first call. The second meal break must occur within six hours of return from the first meal break. Meal breaks must be at least 30 minutes, but the producer can deduct actual time, up to one hour, spent at meals. To synchronize performer and crew meal times, performers may be given a non-deductible 15-minute meal break within two hours of call time. A notation indicating start and end time of this non-deductible meal must be on the production time report. The first meal break would then be due six hours from the end of this non-deductible meal. $25 for the first half-hour or fraction thereof. $35 for the second half-hour or fraction thereof. $50 for each half-hour thereafter or fraction thereof. Note that for Student, Short, and Ultra Low Budget Films, the meal penalty amount is reduced to $25 per half-hour or fraction thereof. Let’s look in detail at the first essential duty every line producer needs to know how to do. A film’s pre-production phase is an exciting time. And the line producer has to channel everyone’s excitement to get the ball rolling. See, once funds are in place, the line producer has to figure out the best kind of company to set up. A film, television, or commercial project should be considered a separate business entity for all intents and purposes. Your new LLC, S Corporation, or Limited Partnership will normally include a variation of the project’s name. Why a new company for one film? An LLC, or limited liability company, for example, limits investor liability to the LLC itself. This protects partners from potential losses incurred. S Corps and Limited Partnerships offer similar benefits. Speak to the financiers or an entertainment lawyer for advice on what kind of company works best for you to set up. Tasks included in setting up a production company? Open a bank account, find a production office, get a phone line, and start an email address. You’ll also want to talk to an insurance broker and consider a completion bond for the production. Hiring a lawyer and finding a payroll company are necessities as well. Finally, create letterhead for the project, and at every step you’ll want to track all production paperwork and documents. What does a line producer do? Guides the pre-production process! The start of the pre-production stage requires a lot of work. But the savvy line producer knows it will pay off in every subsequent phase of production. Speaking of production, one of the most important contributions a line producer will make is determining the union status of a project. Whether or not your project is SAG-AFTRA will greatly impact your budget. It will also affect the level of talent your film attracts. The most important step after you’ve set up your production company is to break down the script. It’s a good idea to review everything you need to know about breaking down a script with this free script breakdown ebook. Your script breakdown is a two-part process. The 1st Assistant Director is usually the first person to break down the script. The best way to get the ball rolling is to use production management software to share files so you can keep tabs and collaborate. The 1st AD answers to the director on set and join the project during pre-production to assist in breaking down the script and hammering out the shooting schedule. In the first pass, the 1st AD will identify ALL the elements of the script that need to be considered for filming. The second part of the script breakdown process is to note timing, scheduling, and locations. Here you and the 1st AD will break out strip boards and start to arrange by location, time of day, talent needs, and other considerations. Line producer software: get up with the breakdown. Yes, it’s labor-intensive. But the more detailed your first breakdown, the easier your life will be. Remember, a script breakdown will be done again by every department head according to their department’s needs. That’s a lot of script breakdowns, but they’re all crucial. The line producer needs a robust first script breakdown to know how many days the shoot will require and, more importantly, how much money will be needed. It’s part of a unified process, with the breakdown leading to scheduling, scheduling leading to budgeting, all the way down to delivery. That’s why it can be crucial to use ordered, end-to-end production management software throughout production. Since the line producer, 1st AD, and every department head will be breaking down the script, we’re talking about a lot of breakdowns. A lot of opportunity for wires getting crossed and files getting lost. Keeping track of a heap of PDFs, screenplay files, Excel and Word docs, and even paper copies is part of the line producer job description. But it doesn’t have to be. Breaking down the script and keeping every single breakdown in one cloud-based, accessible location will make for a more seamless production. The estimated cost of every single aspect of the film. You might have put together an estimated budget to secure funding for the film. But now it’s time to focus on the particulars. See, the original budget was your best-case scenario. The budget that you calculate at this point will have to come in at a specific number. Let’s say with the original budget you estimated $5 million based on non-binding quotes and educated guesses. Now that it’s go-time, the producers have a total budget of $4.3 million. For this next budget, your numbers will need to be much more accurate. Every nuance of the script and shoot have to be taken into consideration. You’ll want to learn how to budget a film the right way. Essentially, you’ll break up your budget into above-the-line (ATL) and below-the-line (BTL) categories. You’ll also need to account for budget contingencies. A line producer must always be mindful of contingencies in the budget. At least 10 percent of the total budget should be set aside for extra expenditures. 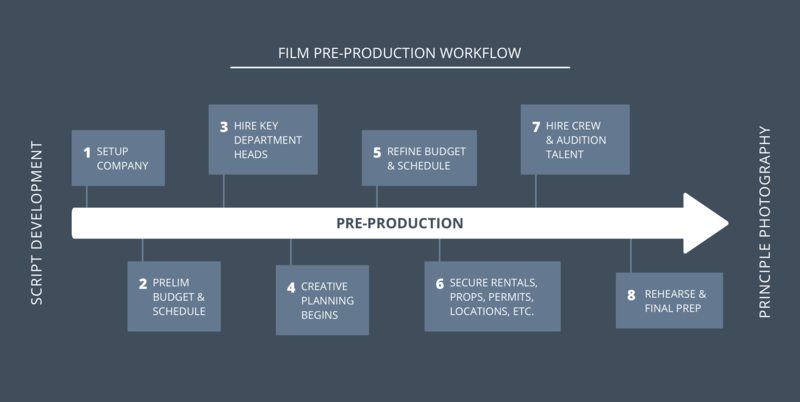 In addition to above-the-line costs like producer, director, writer, and talent fees, and below-the-line costs associated with production and post-production, you’ll also need to keep in mind kit fees, overtime costs and pick-up days. You’ll also need to prepare for the unexpected. Equipment breaks. Locations fall through. Weather doesn’t always cooperate. Depending on where and when you’re filming, current events and holidays might impact your shoot without warning. Tempers can flare, and you might need to replace a key position ASAP. Keeping a reserve of at least 10 percent of the total budget to handle these contingencies is essential. You’ll be a production hero whe n a tricky situation is readily surmounted. Line producer software- be prepared! Digging into your budget is also where your project’s union status comes into play. Unions have tiers for every shoot that determines the wages of the crew and cast. These figures are based on the overall budget. For your project’s actors, and technical crew positions such as sound or camera assistants, union status can give you the confidence that the person has the expertise to get the job done. That’s not to say non-union workers aren’t talented and can’t deliver the goods. And non-union workers are almost always less expensive to hire. It comes down to budget. SAG-AFTRA has a tiered system for determining pay. They use the same system as the other unions, breaking projects into distinct categories: Theatrical, TV, Low-Budget, Modified Low-Budget, Ultra Low-Budget, and New Media. The line producer job description includes knowing how to allocate funds for what is most important to the project. Say Tom Cruise reads your script and decides he wants to do it for less than his usual $20 million fee. He’ll settle for $2 million. But you’ve budgeted talent working for scale. Yikes. If you want Tom in your film (and yes, you do), everyone else’s budget will have to be cut in half. Some producers would suggest paying everyone the same rate by obtaining more money now that a bankable star is attached. Others would make the project Ultra Low-Budget and pay Tom Cruise in a separate agreement. This avoids SAG Bond expenses and lowers the cost of other cast and crew. A big difference in line producer vs. producer duties is that line producers offer insightful budget suggestions, and producers ultimately decides what’s best for the film. Then the line producer has to make it work. That’s right, yet another essential part of the line producer’s job description is to make sure there’s a casting director in place. In addition to setting up a production company, breaking down the script, and putting together the budget and schedule, no line producer definition would be complete without the responsibility of bringing on a casting director. A casting director is a person or team responsible for finding talent. They usually specialize in one particular area such as film, television, commercials, background, or theater. Their main purpose is to find the right talent for a particular project. Some casting directors receive producer credit for their work, especially when the names they bring to a project add considerable marquee value to the production. Casting directors cost money. So will the talent they’ll secure for your production. This is why setting up your budget the right way from the get-go, with a complete software solution, is absolutely necessary. Odds are you’ll have trouble getting a star like Charlize Theron to do your film unless you work with a casting director. But where do you find one? Start with any standout casting directors you’ve worked with before. You can also ask for recommendations from people you trust. Or browse casting directors on Casting Society of America. A line producer should present three to five casting director options for the director and producer to choose from. You don’t have to settle on the first casting director you meet. Some are better suited to independent and low-budget films, while others are more fit for larger studio projects. The line producer should help the director and producers choose a casting directly wisely. As an LP, you’ll have to become a union signatory for casting as well. The Teamsters Local 399 offers resources and forms about becoming a signatory, but always read regulations and agreements carefully. Once a line producer has the budget under control, it’s time to think about the crew. But wait, doesn’t that involve hiring an entire company of skilled, hard-working experts from scratch? And you’ve got to move fast. But right now, we’ll tell you how to do it. And we’ll also share a resource to round out your crew with the best people. Hire your production team first. When it comes to line producer vs. production manager, they are often the same person. You might want to hire a separate production manager if you have the budget for it. Otherwise, buckle down and keep moving forward. A production coordinator, 1st AD, and production assistants will be next. Definitely give some thought to what qualities you want in a production coordinator. They will be the Watson to your Sherlock for the duration of the shoot. You’ll also want to hire a storyboard artist to work with the director as soon as possible. This will be crucial for the next step. The storyboard artist will help the director realize his vision to share with others. Some directors don’t want to work with a storyboard artist. That’s fine. But encourage them to create a moodboard for the Heads of Department (HODs) you’ll be contacting. HODs include the director of photography, production designer, prop master, and so on. Most directors know who they like and who they want to work with. You can reach out to HODs through their agents. Worldwide Production Agency, APA and The Gersh Agency are good places to include in your search. The agents will want to know as many specifics as possible about the project before they involve their clients. This includes info on the director, production team, budget, union status, and shoot dates. Contacting agents for crew is is not as daunting as may think. Most below-the-line crew will have reps that want to keep them working. Don’t be afraid of the major agencies for big-name DPs, editors, and other positions. This can also be a good way to approach above-the-line talent, as you will have established a natural in at the agency. Once you’ve narrowed down the candidates, it’s time for the director and producer to make their decision. And it’s your job to guide them toward the best choice for their team. Even if you already have hundreds of clutch craftspeople in your contact list, or if you’re just starting out, you’ll need to access makeup, gaffers, grips, production assistants, and other creative pros ready to work. A go-to job board for finding and hiring production crew is ProductionBeast. You can post jobs for free; follow, message and hire experienced professionals; manage your database of contacts; and shortlist people for your next project. Once your HODs are locked, plan a production meeting to start scouting locations. Location scouting is a vital step in pre-production. Now that you and the other filmmakers on your production know what kind of settings and scenery will be required, scouting for a locations can begin. But where can you find interesting locations? Which locations welcome film crews? You’ll need to negotiate access to your locations. Companies such as Wrapal, Peerspace, and Giggster are new and alternative ways to find great places to shoot. Location scouting will be the line producer’s first opportunity to see how all the essential department heads communicate with each other. What does a line producer do during this stage? First, he or she must pay careful attention to each location being considered for shooting. Always look for anything that affects the departments during production. What is a line producer? A location-finding mastermind. A line producer must also pay careful attention to the personalities of the HODs. Why? Because once the contracts have been signed, the real characters start to show themselves. And everything about them will be amplified on set when the pressure’s on. Get to know who works well with others, identify problem areas, and try to curb issues before the shoot. It might seem like a line producer’s job description is longer than a feature-length script. It’s true, there’s a lot to oversee to earn your line producer salary, including getting all the equipment for production. That means cameras, grip trucks, even tables and chairs for meal breaks. Your job as an LP is to gather quotes and find the best deal for what your shoot needs. Be a smart shopper. Quality and price are often a delicate balance. Luckily, each department will have already started contacting production houses. For example, the camera department will likely have reached out to Panavision or Arriflex. The Grip & Electric department will get a list ready for Quixote. And the costume department will have pulled items from Western Costume Rentals. Each HOD will present you with their wish list of equipment and expendables for you to approve, according to your budget. It goes without saying that you will want to start this process as soon as possible. Each company will need to set up an account for you. This could take a couple days, depending on your needs. Each company will also need its own insurance certificate. This will be a full-time responsibility for your production coordinator. Go over these lists with your assistant line producer. It is not the job of department heads, the director, or anyone else to make sure you stay on track with your budget. If the production can’t afford the newest camera with the latest bells and whistles, it’s on you to speak up. Keep in mind, it’s common to bid out for your rental needs. Especially for the camera department. Never jump at the sticker price. Haggle as though your top sheet depends on it. It’s hard to get excited about insurance. But a firm understanding of production insurance, knowing why it’s important, and how it works are all crucial points on any line producer resume. You’ve most likely already obtained production insurance during the pre-production phase. A good line producer will always be adjusting his or her work. Insurance is no exception. Once you know the scope of your project, you’ll need to reassess your insurance needs. Line producers routinely work with hundreds of certificates of insurance (COI), vendors, and various requirements. Today, we’ll streamline production insurance for you. It is recommended that you speak with a broker who specializes in entertainment insurance. Film Emporium is a trusted industry leader and works with both indie filmmakers and studios. There is an online application to get you started. Line producer definition: production insurance expert. When filling out the insurance intake form, be as honest as possible and go for the most comprehensive coverage. Go in knowing that basic insurance, short-term or annual, is going to cost at least a few thousand dollars. Beyond this, we advise budgeting 2.5 percent of your total budget for production insurance. You will never regret having too much insurance. What does a line producer do? Provides insurance certificates upon request. When you work with an insurance broker, make sure that your choice is an entertainment insurance broker, specializing in entertainment or production policies.Entertainment insurance brokers understand the world of production, and all the risks involved. They know how to “package the policies” to give you the most coverage at the best rate. An entertainment specialist will also be able to answer questions and provide insight. Insurance is such an integral part of any production that your broker will likely be able to share a few pointers where you least expect it. Note that if insurance brokers advertise policies for businesses, renters, auto, or other forms of insurance, they are most likely not an entertainment insurance specialist. As mentioned, many line producers have the dual title of production manager. That means you, as the line producer, are where the buck stops. The 1st AD is responsible for how the production runs. But the line producer-production manager (LP/PM) must make sure every element is ready for the team. What does a line producer do during the shoot? To start, a line producer should visit every HOD to ensure they’re prepared for the day’s scenes. A line producer should also check for any concerns about future shoot days. Payroll is another consideration the line producer needs to keep in mind on a daily basis. If your talent payroll is late in any way, SAG-AFTRA will shut down your production. They may even snag the bond your production has given them. The payroll company you’ve chosen will be an essential ally to your production. Meet with your production accountant every week to make sure you are on track in every area. Before and throughout the shoot, the line producer will be setting up post production. This means thinking ahead about deliverables for marketing and distribution. It also means taking care to confirm that the post-production pipeline is clearly defined. Line producer definition? Post-prod prepper. The line producer duties of hiring the production crew during pre-production now extends to hiring the post-production crew. This involves the same process. You can use ProductionBeast to hire post-production professionals such as editors, composers, and sound designers. Line producer responsibilities include obtaining a post-production facility, and ensuring the delivery of production materials. A post-production supervisor will oversee post. But you’ll want to touch base with the post supervisor. Stay engaged. Maintain a firm understanding of the post-production process ensure everything stays on track. By the time the ship lands, you’ll need to know every nook and cranny of the production. From call sheets to locations, and from every line of the budget to the minute-by-minute production calendar, a line producer has to be able see the big picture anytime, anywhere. StudioBinder is your bridge on the Starship Enterprise. And the line producer is Captain Kirk — or Captain Picard, if you prefer. Line producer job description: Starfleet Command. For wrap, the line producer will need to calculate things like tax incentives and overages. You’ll also want to keep an eye on all the equipment. What can be returned early? Where can you save money? Coming in under budget can lead to more films on your line producer resume. A line producer should be thinking about deliverables from the beginning of production. Meet with your team. Find out exactly what post-production needs and deliverables are expected. Deliverables are items presented at the completion of a project which follows predetermined guidelines. Deliverables can be in any form and from any department on a project. There is usually one or more persons responsible for gathering these elements for completion. As production wraps, you’ll need to get specific deliverables to completion guarantors, unions, producers, and sales agents. A sales agent represents producers and filmmakers who want to find distributors for their films. Sales agents often play a crucial role in an independent film. They’re well-versed in figuring out a strategy to marketing the film in any number of territories. A good sales agent can even get your film made if the right territories opt-in before cameras roll. Line producers liaise with film sales agents. If you’ve done your job well, this part should be a piece of cake. Simply use your production binder or digital files to produce every contract, release form, location agreement and whatever else is requested. After all the excitement of the production take a moment to breathe. The line producer is vital to the success of any production. Yes, line producing can be taxing in every regard, but your efforts ensure that the production comes in on time and under budget. So catch some shut-eye, and get ready for your next job. We suggest checking out film and video job boards like ProductionBeast to find new opportunities. Now that you have a detailed understanding of line producer job responsibilities, you’re ready to take the first step. Learn how to create script breakdowns, categorize production elements, and generate and track all the reports you need to become a production professional. The breakdown leads to the budget and schedule. Get your production started on the right foot. Hi, Matt, I like the information which you have provided in this blog post. It’s very simple and clear. Please keep sharing more information with us.